Cancelation Policy: Reservations are non-refundable; however, registrants have the option to send an alternate in their place. 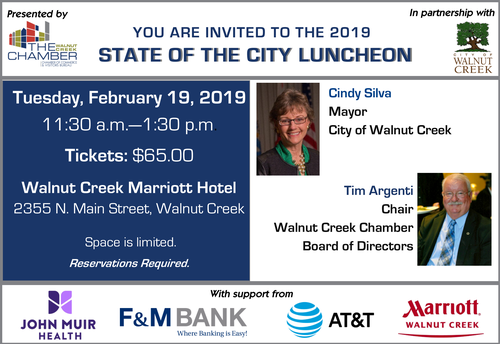 Mayor of Walnut Creek, Cindy Silva, and Tim Argenti, Chair of the Walnut Creek Chamber of Commerce, will review the current status of Walnut Creek and discuss plans for the coming year. This annual luncheon offers a unique networking opportunity and is always a sell-out. Reservations are required.